UP5492vieweast, originally uploaded by jgodsey. As it stands the 2.5 miles of Rail bed belongs to the MBTA. 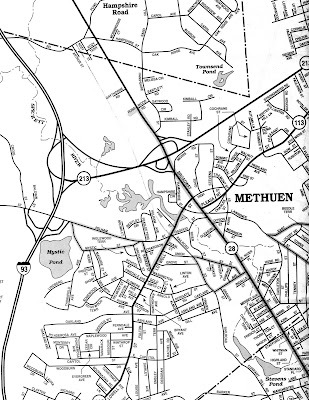 If Methuen wants to develop this property for use as a public Bike/Ped trail, we need to lease the land from the MBTA for 99 years. The section that screams for use by the public runs north from the depot, under five corners, out behind Pine St. through the Nevins Bird Sanctuary, under 213, across MSPCA land, behind the Village Mall and extends parallel to Route 28, until it ends behind the IHOP. This section is only 1.45 miles. Without the trees, shrubs and some odd bits of trash here and there, it is a very nice walk in the country, best described as a cross between a meadow and a country lane.